How to Age Beer: Is a Refrigerator or a Cellar Best? Bro Mist (via Facebook): Does beer age as well refrigerated? Or is cellar temperature best? And, What is your favorite beer to brew? Bob: When aging beer there are several things to consider along with just the temperature. Certainly cellar temperature, around 55 degrees F, is usually just fine. Refrigerator temperature which is usually around 40 degrees F is fine, too. The caution here is to make sure the beer is not exposed to any big temperature fluctuations or subject to any unnecessary agitation. I prefer the cellar option because I have found that beer kept in a fridge that is not strictly dedicated to beer aging tends to be moved around and taken in and out, which exposes it to warming and cooling cycles – like when the wife decrees that the fridge be cleared out or cleaned. The spare fridge in the garage is an option, but these units tend to be older and less efficient models that use more electricity than most people realize. They also tend to become the working beer stash with the frequent opening and closing of the door (in my case anyway) resulting in temperature changes. The constant restocking of working inventory (again, in my case) can cause a lot of reshuffling and disturbing of the aging product which is not necessarily for the best. The annual cost of operation for the beer fridge can easily exceed a couple of hundred dollars, depending on the size of the unit, where you live, and how often you open the door. I decommissioned my beer fridge years ago in favor of cellared beer, which seems to do just fine sitting quietly at no cost. Finally, I have no real favorite beer to brew. I enjoy them all! 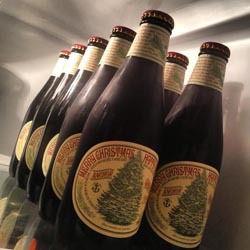 Thank you for the info – I have some Anchor Christmas and Sierra Nevada Big Foot I am saving. Helpful tips!